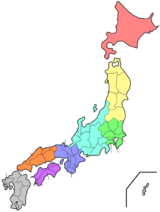 Saitama Prefectur (埼玉県, Saitama-ken) is a prefectur o Japan locatit in the Kantō region o the island o Honshu. The caipital is the ceety o Saitama. This prefectur is pairt o the Greater Tokyo Aurie, an maist o Saitama's ceeties can be describit as suburbs o Tokyo, tae which a lairge amoont o residents commute each day. ↑ Nussbaum, Louis-Frédéric. (2005). "Saitama prefecture" in Japan Encyclopedia, p. 808 at Google Books; "Kantō" in p. 479 at Google Books. Wikimedia Commons haes media relatit tae Saitama prefecture.